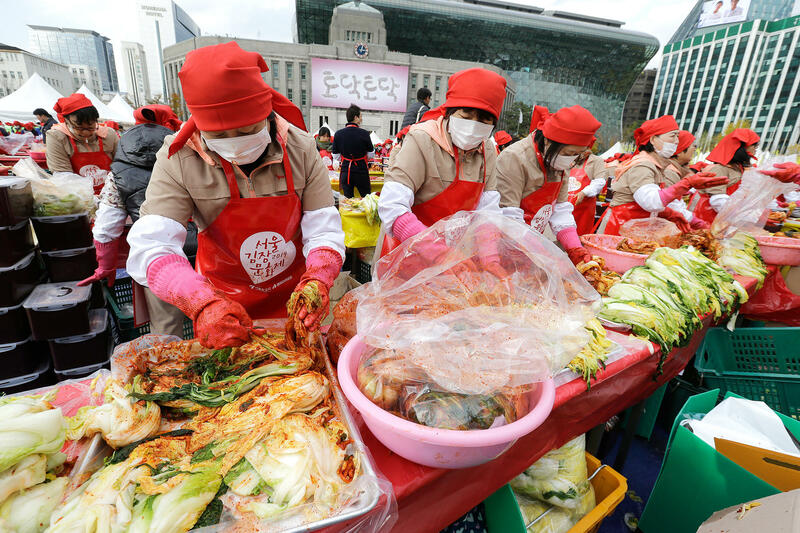 In 2014, about 2,300 people in Seoul made 250 tons of kimchi, a traditional fermented South Korean pungent vegetable dish, to donate to neighbors in preparation for winter. 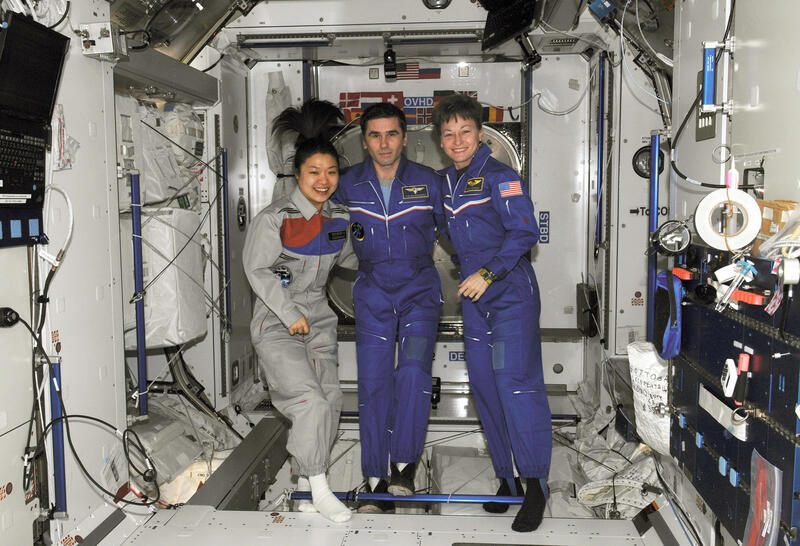 South Korean astronaut Soyeon Yi, seen here with Russian Federal Space Agency cosmonaut Yuri Malenchenko (middle) and NASA astronaut Peggy Whitson (right), prepared kimchi for her fellow space travelers aboard the International Space Station. Si-Hyeon Ryu, who launched the "Kimchi Bus Project" five years ago, has trekked to 34 countries to spread his love of the traditional dish. Everybody eats, which is what makes food a perfect choice to resolve conflicts and foster connections among nations. The concept is called "gastrodiplomacy," and South Korea is one of its strongest champions. The country is one of the world's best at branding itself through food, using its cuisine as a kind of "soft power" to help spread South Korea's influence. And even as the government supports its citizens in opening Korean restaurants around the world, it pays special attention to promoting that most ubiquitous of Korean foods: kimchi. "The Korean government studied a kind of diplomacy using Korean culture, music and especially Korean food," says Byung Hong Park, who is in charge of agriculture, food and rural affairs at the Korean Embassy in Washington, D.C.
"Kimchi is like air in Korea," says Hyunjoo Albrecht, a San Francisco-based chef who grew up near the Korean Demilitarized Zone (DMZ), the strip of land that serves as the border between North Korea and South Korea. "It always has to be in the refrigerator in every house, a big batch." Kimchi is not just cabbage salad — it is essential to the culture of the country. There are hundreds of different varieties of kimchi in Korea, and about 1.5 million tons of it is consumed each year. Even the Korean stock market reflects this obsession: The "Kimchi Index" tracks when Napa cabbage and the 12 other ingredients — chili, carrots, radishes and anchovies among them — are at their best prices. "When I was young, my mom used to make 200 heads of cabbage, wintertime Kimjang," says YouTube's Korean cooking star, Maangchi. Kimjang, the tradition of making kimchi, brought together entire villages and neighborhoods to turn hundreds of heads of cabbages into a source of food and nutrition for people who have historically borne long eras of deprivation and starvation. The kimchi was fermented and aged in underground pots or modern refrigerators. The ritual of Kimjang is so vital to the country's identity that UNESCO added the tradition to its representative list of the intangible cultural heritage of humanity. But the tradition is also threatened, as modern life continues to separate families and make fast food more popular than slow, traditional home-cooking. "It was the time when the women would gather and gossip. There would be matchmaking," says Sunhui Chang, who grew up in Incheon, South Korea, but is now chef and owner of the restaurant FuseBox in Oakland, Calif. "There would be some marriages that came about during the time of kimchi making." Hyunjoo remembers the ritual that took place each November in her village: "You wouldn't greet your neighbors with 'Hi, how are you?' but with 'How many heads of cabbage are you doing?' "
The kimchi-making traveled from house to house through the village. "One person trimming the ginger, one person cutting the cabbage, one person cutting the radish," Hyunjoo says. "It's very labor intensive. You need the help of others." And though Kimjang was a way to bring the community together, Hyunjoo recalls volatile fights between her mother and a neighbor. "They're yelling at each other," she says, "and a few days later they're sitting next to each other cutting cabbage, joking together, making food together." Chang says sharp gender divisions prevailed during Kimjang. "Men weren't really allowed to be around," he says. "I was always told that if the men started hanging around and touching the kimchi, it would be bad kimchi." For decades after the Korean War of the 1950s, the nation barely had enough money to feed itself, let alone enter the space race. It wasn't until 2008 that South Korea chose Soyeon Yi, a woman who had grown up in Gwanju, to be the country's first astronaut. "When I was a kid, I couldn't even dare to be an astronaut," Yi says. "Korea doesn't even have a space agency!" The government had worked for nearly a decade to invent Korean space food. Ten essential dishes were created, two of which were kimchi (freeze-dried and canned). It is difficult for Koreans to imagine a day without kimchi, let alone an entire space expedition. "Having kimchi in space, you are far from your home planet," Yi says. "When you eat your own traditional food, it makes you feel emotionally supported." The kimchi, however, had to be radiated to kill all the microorganisms in the probiotic-rich dish. "After radiation the kimchi became so saggy. [It] looked like it was 100 years old," says Yi. "I cannot say it's a really tasteful kimchi, but still I like it because I can feel my home." 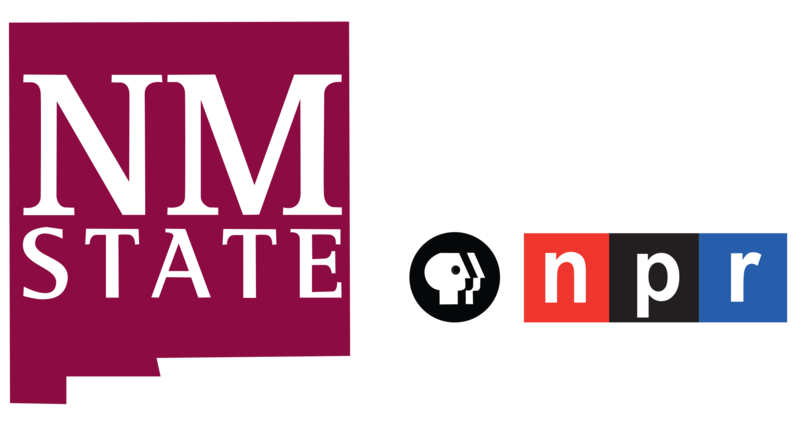 K-Pop, the popular Korean music genre, burst onto the scene with its global hit "Gangnam Style." "We call the Korean food 'K-Food', like 'K-Pop' music," says Park of the government-created campaign designed to popularize the country's cuisine. "The government gave financial support to Korean restaurants in the U.S.," says Hyunjoo, who six years ago started a line of kimchi called "Sinto Gourmet" in America. "They want more people outside Korea to eat more Korean food." 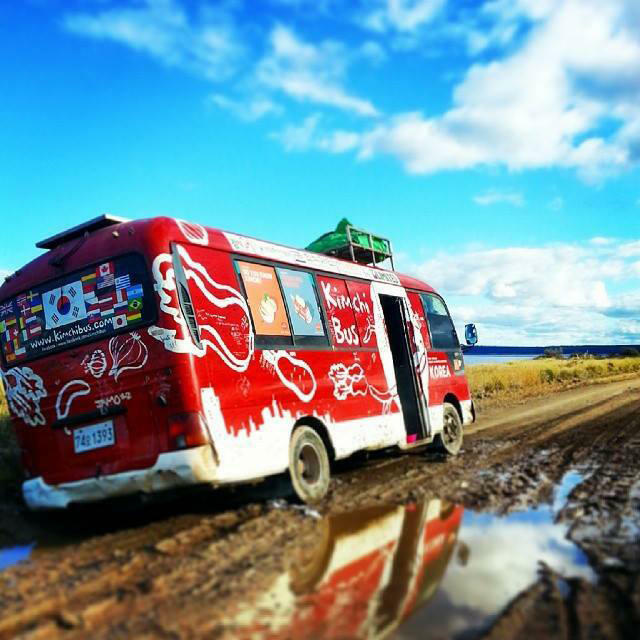 The Kimchi Bus Project was launched five years ago by Si-Hyeon Ryu, a chef and writer from South Korea. Ryu, whose travels are supported by the Korean government, has trekked to 32 countries — from the United States to Argentina to Italy — cooking traditional Korean food and spreading his love of kimchi. "People on the street know just about North and South Korea," he says, but not much about Korean cuisine. "If I explain about kimchi, they will understand about Korea." "The Korean government is very conscious of food culture," says Johanna Mendelson Forman, a professor at American University in Washington, D.C., who specializes in gastrodiplomacy. "The proliferation of Korean restaurants is an extension of that culture. Korea uses that 'kimchi diplomacy' as a way of branding itself." Yi describes a night of kimchi diplomacy in space: "I had a special Korean food night. I made dinner for all other six astronauts on the space station. I still remember one of my Russian colleagues — he tried to tell me it's good. But his face told me ... 'ugh, what the hell it is?' "
"I think food is not just a thing we eat for living," says Yi. "Food helps us trust each other. In Korea we have a saying: Whoever prepares for you the good meal ... you cannot betray them." This recipe comes to us courtesy of Hyunjoo Albrecht of Sinto Gourmet. 1. Cook bacon in a 12-inch nonstick skillet over medium-high heat for about 3 minutes until golden brown. Take out bacon from the pan and set aside on a paper towel but leave bacon fat in the pan. 2. In the same pan with bacon fat in it, add the yellow onion and kimchi. Saute until the onion becomes translucent and kimchi is somewhat sweated out for about 3 to 4 minutes. 3. Add rice in the pan and try to break the lump of rice with an up and down motion using a flat wooden spoon or spatula, then stir for about 5 minutes. If the pan gets too dry from rice soaking up the oil, add canola oil or vegetable oil about one tablespoon at a time as you stir fry the mixture of rice, yellow onion, and Kimchi. If you like a stronger kimchi flavor, add kimchi juice a tablespoon at a time as you continue to stir fry. 6. 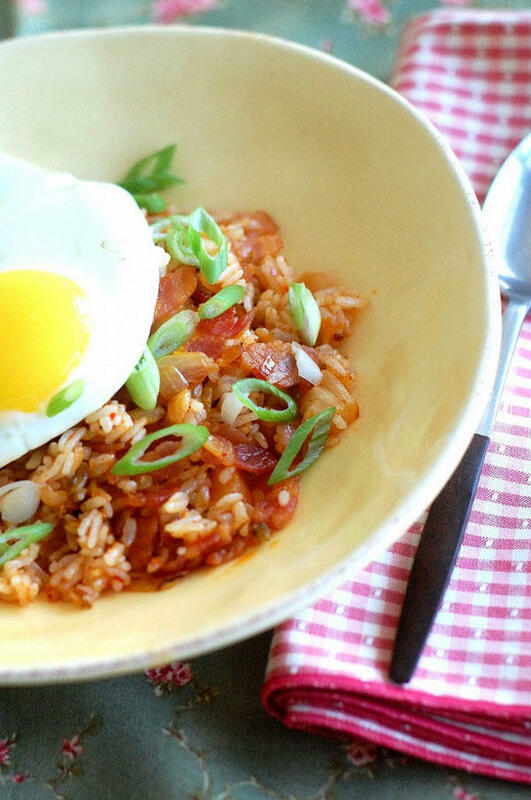 Transfer rice to a serving platter, put a cooked egg on top, and sprinkle with green onion before serving. IMPORTANT: Don't try to make kimchi fried rice with hot or warm rice. It will turn out incredibly mushy. Use only cold or at least slightly chilled rice. Time again for Hidden Kitchens: War & Peace & Food. Today the Kitchen Sisters, Davia Nelson and Nikki Silva, take us into the world of gastro-diplomacy. That's where countries share foods as a way to create connections, spread influence and help resolve conflict. In South Korea, they call it kimchi-diplomacy. SOYEON YI: Having kimchi in space, you are far from your home planet. When you eat your own traditional food, that makes you feel emotionally supported. In Korea, there's more than 100 kinds of kimchi. I'm Soyeon Yi, first Korean astronaut in space. When I was a kid, couldn't dare to dream to be an astronaut. Korea even doesn't have a space agency. We had a really, really hard time to feed our own people. Finally, they made a contract with Russian space agency. Korean government decided to develop 10 different kinds of a Korean space food. Two of them was kimchi. One is the freeze-dried kimchi. You add the water and then shake it. And another one is a canned kimchi, like a tuna can. They tried several different ways to radiate kimchi to kill all the micro-organism. But after radiation, kimchi became so saggy. Kimchi looks like 100 years old (laughter). So I cannot say that it's a really tasteful kimchi. But still, I like it because I can feel my home. MAANGCHI: This is Napa cabbage. YI: Every single meal, I should have a kimchi. Sometimes I have a seven, eight different kinds of kimchi on the table. BYUNG HONG PARK: Koreans consume 1.5 billion tons of kimchi a year. My name is Byung Hong Park, Korean Embassy, Washington, D.C. I am in charge of agriculture, food and rural affairs. Korean government started a kind of diplomacy using Korean culture, music, especially Korean food like kimchi. We call the Korean food K food, like K pop music, K food. SEHEE KIM: Cultural soft power, soft diplomacy, a way of just letting people know who Korea is. My name is Sehee Kim, researcher here at the Embassy of Korea in Washington, D.C.
HYUNJOO ALBRECHT: Korean government gave financial support to some of the Korean restaurants in U.S. My name Hyunjoo. I have my kimchi business Sinto Gourmet in Bay Area. Korean government want more people outside of Korea eat more Korean food. SI-HYEONG RYU: I'm Si-Hyeong Ryu from South Korea, Kimchi Bus. I'm chef and traveler cooking traditional Korean food. People on the street, if I explain about kimchi, they will understand about Korea. UNIDENTIFIED MAN #1: Si-Hyeong remodeled the used shuttle bus into Kimchi Bus and traveled a total of 32 countries, including Europe, South America and Japan. He introduced Korean food to the world. UNIDENTIFIED MAN #2: (Singing) I don't care what they say, I'm in love with you kimchi. You're my favorite food. JOHANNA MENDELSON FORMAN: The Korean government is very conscious of food culture. The proliferation of Korean restaurants is an extension of that culture. I'm Johanna Mendelson Forman, research professor at the American University. Kimchi is something that they export. Korea uses that kimchi-diplomacy as a way of branding itself. UNIDENTIFIED MAN #2: K-I-M-C-H-double E, that's the way we spell tasty. UNIDENTIFIED MAN #3: The Vietnam War in the 1960s took a heavy toll on the strength and spirits of Korean soldiers. They couldn't go on fighting subsisting on the greasy field rations provided by the American Army. KIM: During the Vietnam War, the Korean president requested to U.S. government, please send some kimchi to Korean soldiers in Vietnam because the Korean soldiers are so longing for Korean food. UNIDENTIFIED MAN #3: They asked for kimchi. That's how the Korean K-ration came into being. MAANGCHI: When I was young, my mom used to make 200 heads of cabbage - wintertime Kimjang. ALBRECHT: We have this ritual Kimjang. First week of November or so, people are getting ready to buy a lot of Napa cabbages. They make huge batch of kimchi. It's very labor intensive. You need the help of others. CHANG: There was a time when the women would gather, gossip, there would be matchmaking. You know, there would be some marriages that came about during the time of kimchi making. My name is Sunhui Chang, chef and owner of FuseBox, West Oakland. I grew up in Incheon, Korea. ALBRECHT: Whole village, they schedule. Next Monday, is at Ms. Lisa's house. All other ladies get together in Ms. Lisa's house. They bring their own knife. One person trimming the ginger, one person cut the cabbage, one person cut the radish. CHANG: Men weren't really allowed to be around. I was always told that if the men started hanging around and touching the kimchi, it would be bad kimchi. ALBRECHT: My mom and neighbor Ms. Lisa really fight seriously. They're yelling at each other. And a few days after, they're sitting right next to each other cutting cabbage, making jokes together, making food together. UNIDENTIFIED WOMAN: We are preparing for contact. UNIDENTIFIED MAN #4: Docking confirmed over Kazakhstan. YI: I had a special Korean food night in space, part of the kimchi-diplomacy thing (laughter). I made a special Korean dinner for all other six astronauts in space station. I share my Korean space food. That night became a good diplomatic moment among the American astronaut and Russian astronaut. I still remember one of my Russian colleague, he tried to tell me it's good. But his face told me, oh, what the hell it is. I think food is not just a thing we eat for a living. Food help us trust each other. In Korea, we have a saying. Whoever prepared for you the good meal of the good rice, you cannot betray them. MONTAGNE: Kimchi-diplomacy was produced by the Kitchen Sisters with Nathan Dalton and Brandi Howell and mixed by Jim McKee. You'll find more Kitchen Sisters stories on their podcast, Fugitive Waves. Transcript provided by NPR, Copyright NPR.